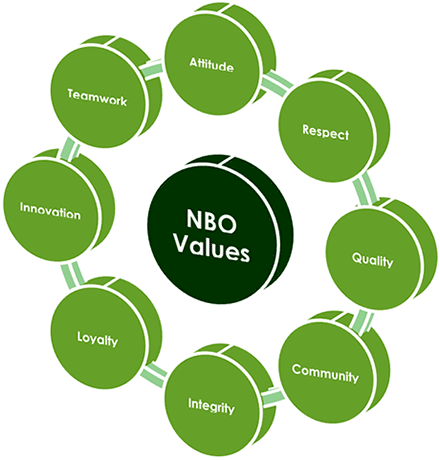 NBOGroup lives by our vision and values. Since 1988, we have helped organizations unlock the individual potential of leaders at all levels. Our philosophy is based upon the belief that leaders are made, not born, and that they can adapt and change. We believe that effective interpersonal skills, grounded in strong personal values, reflection and self-awareness, are key to effective leadership. We provide quality, relevant, and exciting learning that improves people’s capabilities, and we work to achieve this by committing to values that are important to us and to you. Every NBOGroup product, program and service is designed to fit the specific learning objectives of your organization. For more than 25 years, Fortune 500 companies and Government organizations have benefited from results achieved by working with us. Our international experience, and work with multi-cultural groups has enabled us to provide excellent results globally. Our emphasis is on the development of practical competencies, not stereotyped techniques. This approach delivers greater impact within a training session, a lasting application by the participant, and a return on investment for the organization. Our unique concepts in our product design, learning initiatives and coaching allow for measurable results to be achieved. We accomplish this through the most effective experiential training and learning processes in the market. In addition, we collaborate and build practical metrics to ensure ROI. We offer you a total people development resource with the philosophy that our relationship is “a partnership that continues”. We look forward to the opportunity of working with you. NBOGroup’s strategic partners worldwide enable us to serve our clients wherever they are.